Can I just say how much I've been enjoying these Daring Bakers and Daring Cooks challenges? I joined the groups to push my limits and learn, learn, learn... and I definitely have. This layered chocolate hazelnut caramel torte was a series of firsts for me and definitely not something I would have made on my own. I brought it to a party with lots to celebrate: our friend Jon's birthday and our friend Peter's Ph.D.-receiving! Despite its rustic (my new favorite euphemism to describe my chaotic-looking baked creations) appearance, it actually tasted phenomenal and quite worthy of the momentous celebration. For the recipe, please visit Angela and Lorraine's lovely blogs, and, as always, visit the blogroll to see how my fellow Daring Bakers fared this month. Oh, and if you're a beginner like me, block out at least 4 hours of your day and save up up all of your baking and emotional energy to use for the afternoon. This one's quite a roller coaster, but 100% worth the thrill! glad it tasted so good. great job. I'm so glad you enjoyed it! I love that picture of it on the plate. Love the pictures =D. Wonderful job with this challenge!! WOW WOW WOW!!!!! Amazing and beautiful. Great job!!! 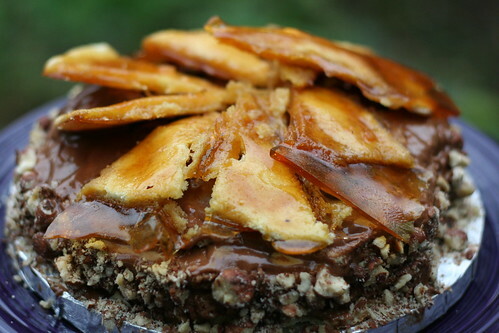 That is beautiful...all these beautiful tortes on all these beautiful blogs is making me wish I were a Daring Baker! Great job. It looks so scrumptious and enticing. you took the challenge and met it, masterfully! great job, amy!!! Good for you that you've been tackling the Cook's Challenges too. Not me. Such a complete slacker. 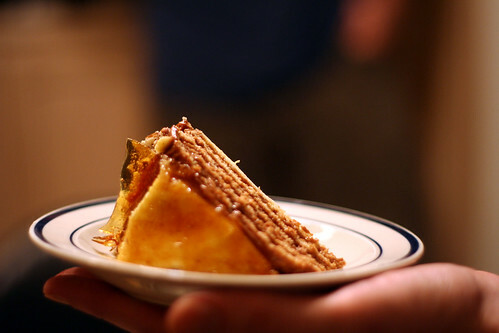 Your torta is truly gorgeous. You call it rustic, but I call it something I'd love to see on a plate and ready for me to tuck into. All that chocolaty wonderfulness. Very nice.